The bark of Cinnamamunz cassia Presl , of family Lauraceae. Sweat and pungent with heavy fragrance. Intact, heavy, smooth and thick, purple cross section, heavy oily, less fibre. Pungent, sweet, hot; kidney, spleen, heart and liver meridians entered. Reinforce fire and strengthen yang, dispel cold and stop pain, warm meridians and collaterals. It has the actions of reinforcing fire and strengthening yang, warming yang and dispersing cold. Its actions are similar to Fu Zi but without the action of restoring yang from collapse. It is also the essential herb for reinforcing fire and strengthening yang. For the kidney yang deficiency and life gate fire insufficiency syndrome manifested as intolerance of cold and cold limbs, soreness and coldness of loins and knees, nocturia, impotence and seminal emission, it is combined with the kidney-yang-warming herbs. For instance it is combined with Lu Jiao Jiao and Fu Zi in You Gui Yin described from Jing Yue Quan Shu. 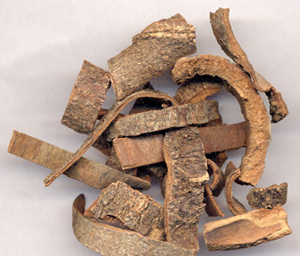 For gastric-abdominal cold pain, poor appetite and loose stool due to deficiency of kidney-spleen yang, it is combined with kidney-spleen-warming herbs. For instance it is combined with Fu Zi, Ren Shen and Bai Zhu) in Gui Fu Li Zhong Wan from San Yin Fang. For palpitation, oppression in chest, it is combined with the yang-warming and qi-tonifying herbs. For instance it is combined with Ren Shen and Huang Qi in Bao Yuan Tang from Bo Ai Xin Jian. It is good at dispelling cold, warming meridians and alleviating pain, and indicated for all pain syndromes clue to congealing cold. For gastric-abdominal pain caused by deficiency and coldness of spleen and stomach or invasion of exogenous coldness, it can be used alone or combined with other meridians-warming and coldness-dispersing herbs. For instance it is combined with Gan Jiang, Gao Liang Jiang and Bi Bo in Da Yi Han Wan from Tai Ping Hui Min He Ji Ju Fang. For angina pectoris induced by deficiency of chest yang or invasion of exogenous coldness, it is combined with the cold-dispersing and pain-alleviating herbs. For instance it is combined with Fu Zi, Gan Jiang and Chuan Jiao in Gui Fu Wan from Shou Shi Bao Yuan. For arthralgia of wind-cold-damp type or cold arthralgia, it is combined with wind-damp-dispelling and liver-kidney-tonifying herbs. For instance it is combined with Du Huo, Sang Ji Sheng and Du Zhong in Du Huo ji Sheng Tang from Qian Jin Yao Fang. For amenorrhea and dysmenorrhea caused by deficiency-cold of thoroughfare and conception vessels and / or congealing cold and blood stasis, it is combined with the blood-activating and qi-moving, cold-dispersing and pain-alleviating herbs. For instance it is combined with Dang Gui, Chuan Xiong and Xiao Hui Xiang in Shao Fu Zhu Yu Tang from Yi Lin Gai Cuo. For deep-rooted carbuncle and deep multiple abscesses due to congealing cold and yang deficiency, blood stasis and phlegm accumulation, it is combined with meridians-warming and yang-unblocking, coldness-dispersing and stasis-resolving herbs. For instance it is combined with Lu Jiao Jiao, Bai Jie Zi and Ma Huang in Yang He Tang from Wai Ke Quan Sheng Ji (Life-Saving Manual of Diagnosis and Treatment of External Diseases). It has the actions of warming and unblocking blood-vessles, activating blood and resolving stasis. It is usually combined with blood-activating herbs for congealing cold and blood stasis syndrome. For postpartum abdominal pain and lochiorrhea due to obstruction of stagnant blood, it is usually combined with Dang Gui and Chuan Xiong. For female abdominal pain and mass due to qi stagnation and blood stasis, it is combined with the qi-moving, blood-activation and mass-resolving herbs. For instance it is combined with E Zhu, Tao Ren, Chi Shao and Zhi Qiao in Peng E Zhu Wan from Ji Yin Gang Mu (Compendium of Therapy on Women’s Disease). For hernia of cold type with abdominal pain, it is combined with the liver-warming and cold-dispersing, qi-moving and pain-alleviating herbs. For instance it is combined with Xiao Hui Xiang, Chen Xiang and Wu Yao in Nuan Gan Jian from Jing Yue Quan Shu. For trauma and pain of joint, it is combined with the blood-activating and trauma-curing herbs. For instance it is combined with Dang Gui, Chuan Xiong and Ze Lan in Dang Gui San from Bo Ji Fang (Extensive Relieving Prescriptions). In addition, small amount of Rou Gui is usually used for qi and blood deficiency syndrome because it can reinforce yang to promote the generation of qi-blood, such as the formula Shi Quan Da Bu Tang and Ren Shen Yang Rong Tang. Decoct 1～5 g. It should be decocted later or soaked in water for taking. 1~2 g of the powder is taken after mixed with water. It is contraindicated for syndrome of yin deficiency with fire effulgent, hemorrhage due to blood heat and pregnant women. It is incompatible with Chi Shi Zhi (nineteen incompatibilities).